Yaron Stavi plays bass on Phil Manzanera's last few solo albums as well as the live dates in support of the Firebird V11 album. 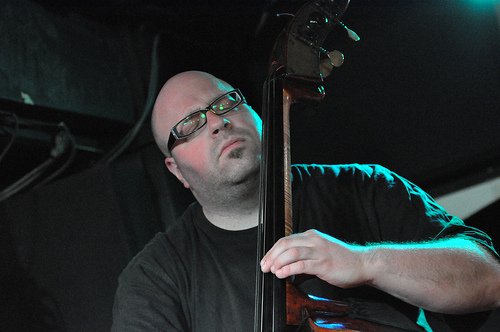 Yaron Stavi plays double bass and electric bass in various styles of music including Jazz, Rock, Classical and World Music. He studied Classical music in Berlin and played with numerous orchestras and conductors around Europe, North America and Asia. He was principal bass player of the Mahler Youth Orchestra, playing under Seiji Ozawa, Pierre Boulez, Marris Jansons, Sir Neville Mariner, Ivan Fischer and others. In 2002 Yaron moved to London. He is a member of Gilad Atzmon’s band The Orient House Ensemble which regularly tours Europe and won best CD in the BBC Jazz awards in 2003. He has played with the violinist Nigel Kennedy in his Jazz band and Jazz musicians including Larry Coryell, Peter King, Jarek Smietana, Leszek Mozdzer, Gary Husband, John Ethridge, Julian Siegel, Gene Calderazzo, Stephen Keogh, and Estelle Kokot. Yaron played on Robert Wyatt’s albums Cuckooland and Comicopera and recorded two albums for John Zorn’s label Tzadik with Koby Israelite. He appears on Phil Manzanera’s (Roxy Music) albums 6PM, Vozero and 50 Minutes Later, recorded an album with David Gilmour in 2005 and instrumental album with Phil Manzanera in 2007.